In July 2002, all parking enforcement in NSW will be transferred from the NSW Police to Councils. Claiming credit for this action, the Chairman of the PCA, Mr Harold Scruby said: “Shortly after Commissioner Peter Ryan was appointed in 1996, the Pedestrian Council of Australia (PCA) wrote to him requesting that he consider transferring parking enforcement (excepting emergencies) to Local Councils. We had the written support of the RTA who stated: ‘Council parking enforcement may facilitate optimum deployment of Police resources, so that enforcement is focussed more precisely on the key driver behaviours which contribute to much of our road trauma.’ Mr Ryan was dismissive of our request claiming his parking officers were the amongst the best in the world and the eyes and ears of the community. “Unconvinced, we took our concerns directly to the then NSW Auditor-General, Mr Tony Harris. He undertook a year-long, comprehensive study into Street Parking Enforcement which was released in November 1999. The report revealed the most inefficient, mismanaged, ineffective, inept, parking enforcement system in Australia; a focus on commerce over safety and work-practices which would make a wharfie blush. The report was the catalyst the NSW Government needed to transfer all parking to Councils. ”It is extraordinary that NSW Police still wish to manage the functions of mobile and red-light speed camera enforcement along with the collection of fines. In Victoria, since the entire function was outsourced, the total number of vehicles detected travelling above the threshold speed, or as otherwise known, 'Percentage Prosecutability' has significantly improved from around 65% to just over 80% and 16 police officers have been put back onto the roads and footpaths of Victoria. ”Secondly, the A-G made a number of strong recommendations including; measuring performance, accountability, technology, consistency and human resources. It is vital that all NSW Councils are required to implement these recommendations immediately and that a new parking enforcement culture of “safety before commerce” is swiftly embraced. We call upon the NSW Minister for Local Government, the Hon Harry Woods, to require Councils to formally adopt and act upon the A-G’s recommendations as soon as practicable.” Mr Scruby said. The Chairman of the Pedestrian Council of Australia (PCA), Mr Harold Scruby, today congratulated the NSW Government on its decision to transfer all parking enforcement responsibilities to Local Government. Mr Scruby said: "The PCA was instrumental in convincing the NSW Government to make this decision. "This has been the result of our five-year campaign to move all parking enforcement responsibilities from the NSW Police Service controlled Parking Patrol Officers (PPOs) to NSW Councils. "Over four years ago, we obtained the written support of the RTA: (copy of letter attached - quote): `Council parking enforcement may facilitate optimum deployment of Police resources, so that enforcement is focussed more precisely on key driver behaviours which contribute to much of our road trauma'. 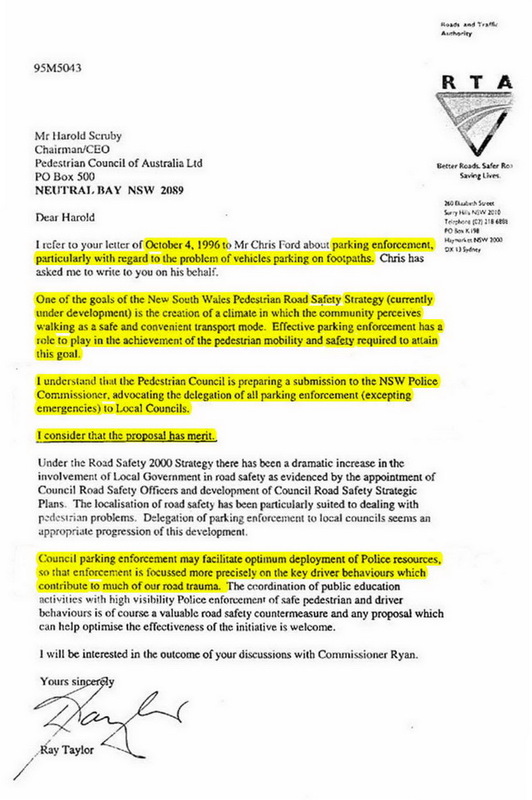 Mr Scruby said: "In September 1996, we appealed to the then newly appointed Police Commissioner, Mr Peter Ryan, (copy attached) to undertake an independent inquiry into Parking Enforcement. In spite of many attempts, we were unsuccessful. "His report, released on 24 November 1999, found that PPOs are extraordinarily inefficient and ineffective. They issue an average of 2,300 PINs (Parking Infringement Notices) per annum, about half the amount issued in most other states and one third of those issued in cities such as Wellington NZ (7,000 PINs PA). They are generally unaccountable, poorly managed and have been permitted to adopt work-practices which would make a wharfie blush. Their focus and priority is commerce, not safety. They can spot an expired parking meter at half a mile, but are culturally incapable of booking taxis stopped in pedestrian zones, motorists in bus-zones, couriers on footpaths and double-parked trucks. "In his defence, we have great support for Mr Ryan and believe he has vastly improved the efficiency and morale of the NSW Police Service. He may have been initially poorly informed or seen Parking Enforcement as a low priority. We wish to congratulate Commissioner Ryan as he has now decided to embrace change and has realised that Parking Enforcement should be transferred to Local Councils, a move we know has the support of most NSW police," Mr Scruby said. "Local Government is far better equipped to manage the 3E's of Street Parking management: Education, Engineering and Enforcement, freeing police to focus on fighting crime and assisting in reducing our appalling Road Toll which is now nearly 10% up on last year. Mr Scruby said: "We now call upon the Minister for Roads and Transport, Mr Scully and the RTA to undertake a review of all parking fines, as recommended by the Auditor-General. "Currently, the fines and penalties are a veritable dog's breakfast. Some actually serve to encourage motorists to stop and park dangerously. We must educate motorists to understand that dangerous parking, such as stopping in pedestrian or bus zones, double-parking, or parking and blocking footpaths, can have the same deadly consequences as dangerous driving. The Government must urgently change the fines and penalties to properly reflect the gravity of these offences and to discourage such dangerous behaviour," he said. A turf war between the Police Commissioner, Mr Ryan, and Sydney councils has erupted over the right to issue parking tickets and reap the multi-million-dollar revenue. A Police Service spokesperson confirmed last night that existing contracts with councils would not be renewed, diverting parking infringement fines back to police coffers. Last year, police wrote 750,000 tickets across NSW worth about $40 million. Councils, which have to negotiate patrol areas with local police commanders, earned an estimated $20 million from tickets issued by their rangers. But Mr Ryan, who has aired concerns about his limited budget, insists councils should bow out. "Parking police provide a valuable intelligence source to local police," a spokesman for Mr Ryan said. "Current agreements between police and local governments regarding on-street parking enforcement will be allowed to run their full term." The problem has also drawn the attention of the NSW Auditor-General, Mr Tony Harris, who confirmed yesterday that he planned to investigate parking ordinances. But the move has upset the chairman of the Pedestrian Council of Australia, Mr Harold Scruby, who said it would lead to parking chaos on city streets. "Police will simply not attend to parking matters and it is our view that they should not be involved in this area of policing," he said. "We are fully supported by the RTA [Roads and Traffic Authority] who have put their views in writing, stating that they believe all parking enforcement should be transferred to councils." Sydney City Council earns more than $2 million a year from parking tickets, while councils such as North Sydney and Pittwater each collect about $1 million a year.